Funding Source: NSF-EAR: Earth Sciences: Instrumentation and Facilities. A great earthquake of magnitude 8.8 occurred on February 27, in Southern Chile. The Chilean earthquake caused a deadly tsunami, widespread property damage, and at least 521 casualties. This was the single largest event in the world since the December 26, 2004 magnitude 9.1 earthquake in Sumatra that also caused a deadly tsunami. In response to the Chile event, UNAVCO engineers designed a set of portable communications units to deploy at new or existing GPS sites located in the region near the earthquake epicenter. The communications units contain either a satellite or cellular modem, and a self-sufficient power system consisting of photo-voltaic and battery power sources. 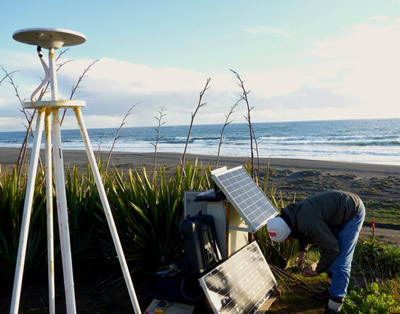 The purpose of this equipment is to telemeter data from remote sites to UNAVCO for use by researchers assessing the post-seismic response of large magnitude earthquakes. Because of technical limitations, high-rate GPS data must be archived soon after significant aftershock earthquakes to permit a complete time-series. The communication units allow for greater data collection capabilities in the crucial moments following a large, destructive earthquake. In the future, the communications equipment can be quickly re-deployed to new earthquake events. The project is funded by the National Science Foundation. Figure 1 - Riki Cser inspects a solar panel during the installation of UNAVCO communications equipment at a permanent GPS site near the epicenter of the February 27, magnitude 8.8 Chilean earthquake.